Microsoft is looking to take back the affordable laptop market from the clutches of Google's Chromebooks. Microsoft COO Kevin Turner revealed that HP is planning to release a $199 (about £116, AU$211) Windows laptop at the company's annual Worldwide Partner Conference going on right now in Washington, D.C. Supposedly called the "Stream," the laptop could be released in time for the holidays. The Microsoft exec also revealed HP's plan to release the Stream in 7- and 8-inch form factors (i.e. tablets) that will run a version of Windows for $99 (about £57, AU$105) around the same time. 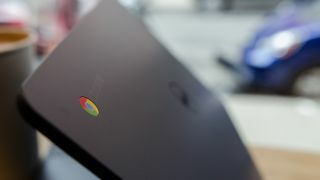 Turner didn't detail any further specifications on the budget Windows machines, but he did make some pointed remarks at Chromebooks. "We are going to participate at the low-end," Turner said. "We've got a great value proposition against Chromebooks, we are not ceding the market to anyone." At these super affordable price points the Stream would come at a bargain, beating out many of Google's affordable cloud-powered laptops like the Dell Chromebook 11 and Toshiba Chromebook. On top of outing the existence of the Stream, Turner also detailed two $249 (about £145, AU$265) laptop options from Acer and Toshiba. First is the 15.6-inch Acer Aspire ES1 equipped with a 2.16GHz Intel Celeron processor. Storage-wise the affordable notebook will also come with a 500GB HDD and 4G of RAM. Toshiba, meanwhile, will have a smaller 11.6-inch offering that weighs just 2.4 pounds. The unsurprisingly named Toshiba 11.6 will also hit shelves this holiday season featuring a slightly cramped 32GB SSD - which could be dangerously small considering the amount of space Windows 8.1 takes. Microsoft also marketed Windows as a better option at the event, noting a few features it does better than Chromebooks. Specifically, the Redmond company stressed Windows is better at running desktop applications, working offline, and sending files directly to a printer. Microsoft is taking the affordable market fight directly to Chromebooks, and it will be interesting to see if these Celeron-powered, budget machines become popular just as Netbooks did so many years ago.